Quakers are also known as Quaker Parakeets or Monk Parrots and make wonderful, loyal, and intelligent pets. Here are 6 of their best features if you are considering opening your home to a Quaker. They are beautiful in color which in nature is usually a brilliant green, not unlike the color of new spring grass, with blue feathers and light grey on their face and chest. Breeders have increased color choices to include blue, white, and yellow to name a few. They weigh in between 75 to 125 grams. They average about 12 inches from beak to tail and look very similar to a parakeet with a heavier body build. Known for their sweet and gentle ways, particularly if they have been hand fed from an early age, they make a great addition to the family. Loyal to one person, or can be great with children with lots of supervision, and will accept others in the family if a pattern of social interaction is established early and maintained. Their ability to talk is astounding, and with proper training, they can often respond with words appropriate for various situations. Consistent training is the key to such high-level behaviors. Thank goodness they are not fussy eaters! Most will eat pellets, seeds, and a variety of fresh fruits and vegetables (organic is best), pasta, grains, legumes, and seeds (sprouted seeds are the most nutritious). Your bird will let you know which of these are its favorites. They can also be fed some lactose intolerant dairy products since all birds are lactose-challenged. Avoid chocolate, caffeine, avocado, rhubarb, and alcohol as all are toxic to birds. Quakers need space to be active both inside and out of the cage. Provide a high-quality cage that is spacious, easy to clean and it will probably last for your bird's entire life. Setting up a play area outside of the cage with toys, perches, and swings will help keep your bird physically fit, and emotionally balanced as well. Plan to allow your bird several hours, more if possible, outside the cage daily. If you are looking for a companion for life, you'll have a friend in this little bird as it often lives 20 to 30 years. These birds are illegal in some parts of the United States, so make sure you check your locality before purchasing one, and before moving to another part of the country with one. Generally considered as quite hardy, these birds can also adapt well to changes in climate. They are still susceptible to diseases that are spread through airborne viruses. Steps to avoid disease and infection include cleaning their cage daily, providing fresh water, removing fresh food before it can spoil, and filter their air with a HEPA air purifier. The Quaker Parrot is a medium-sized bird that makes an excellent pet. They are the best talkers out of all mid-sized birds and are relatively inexpensive. Quakers do require lots of time and dedication though. Quaker parrots originate from South America. They are also known as Quaker Parakeets. They are mainly found in Brazil, Paraguay, Argentina, Uruguay, and Bolivia. However, today there are even some Quakers that live in the United States. The ones living wild in the United States have escaped birds that have established themselves there. There are many Quaker parrots living in Florida. The average Quaker is around eleven inches long and weighs around 90 to 120 grams. They are about the size of a cockatiel but are much stockier. 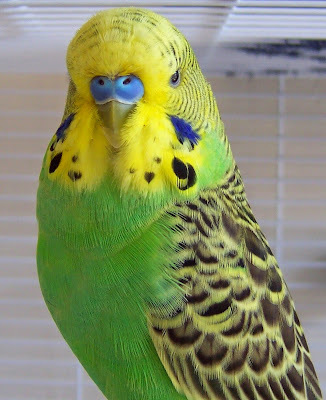 The predominant color of these birds is green, but other mutations such as albino, pied, cinnamon, lutino and blue-cinnamon are available. They also have very beautiful blue and green tail feathers. Their bill is either light yellow or horn colored. In some places, Quaker parrots are illegal, so be sure you make sure that you can own one before trying to bring one home. They are prolific breeders and if the birds escape, they can form very large populations. This could become a problem, so this is why some states have laws against them. States in which they are illegal to include California, Tennessee, Kentucky, Wyoming, Rhode Island, Pennsylvania, and Hawaii. It is very important that you put your bird on a good diet to maintain their health. The base diet should be pellets, not seeds. Other foods such as vegetables, fruits, bread and grains should also be offered. Variety is always good on a diet. You should not feed too many seeds. Some things you should never feed are caffeine, chocolate, alcohol, and avocado. These are toxic to all bird species. Food and water need to be in the cage at all times. The minimum cage size for Quakers is 18 inches long by 18 inches wide by 24 inches tall. Try to get the biggest cage you can for your bird. Some Quakers tend to get territorial around their space, which is their cage. You can usually prevent this by having a "bedroom" in the cage. A sleeping box works great for this. You should also get many different types of toys to keep your bird busy. You will need to keep your bird's wings clipped and their nails trimmed. Almost all Quakers also love baths. Just fill a dish with about an inch of water and let your bird take a bath. Try to provide bath water as often as you can. You should at least let them take a bath once a week. This will really help their skin and feathers, as well as provide entertainment for your bird. Quakers are very sweet birds that always want to be around you. They are very loyal to their owners and playful but can be stubborn as well. They have a great talking ability and are very entertaining birds. Be aware before you purchase a Quaker parrot that they are noisy birds. They love noise and this is what makes them such good talkers. Talking isn't their only noise though. They will often make loud screeching noises that can be very annoying. Quakers do best in homes that spend plenty of time with them. You need to realize that these birds need lots of love and attention. Be sure that this bird is what you want before you get one. Have you ever had much to do with a Quaker parrot? They are an engaging parrot and love being around lots of people. Traditionally Quaker parrots are bright green on top with a white to grey face and chest feathers. They are about mid-range in size, growing in length to about 12 inches. 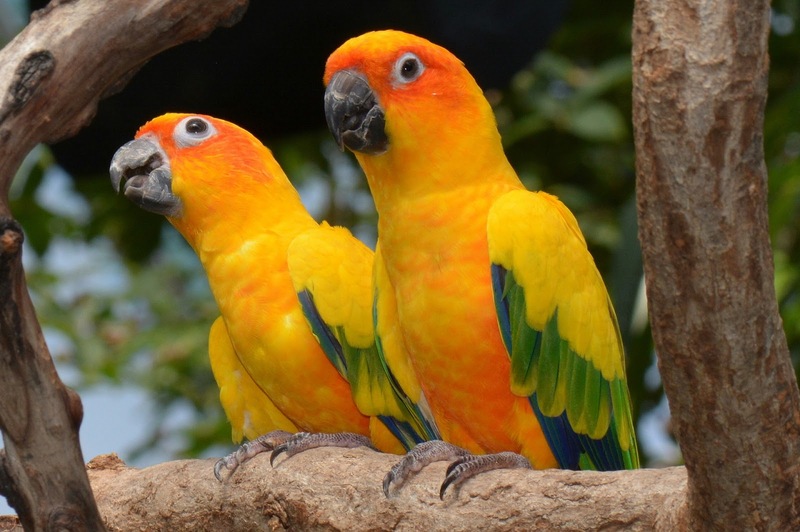 The Quaker parrot may be the answer for you if you are looking for a talking bird. It learns quite easily and the parrot does bond well with its owner. In fact, he loves to be involved with people on a regular basis. When teaching a parrot to talk it is best if the teaching is done by just one member of the family but I am sure you will find the bird making sounds or words that other members of the family use as well. 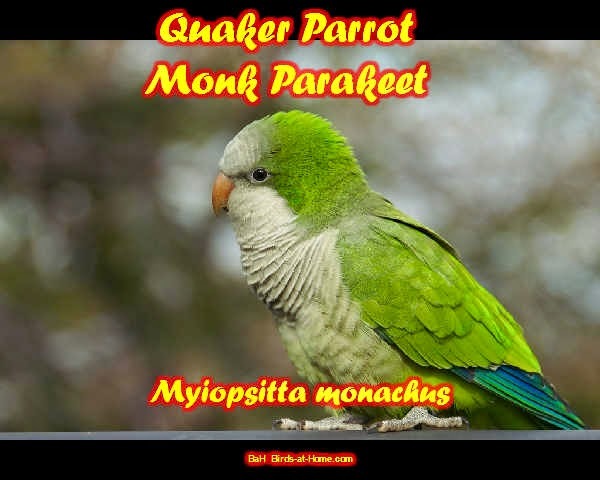 One feature of the Quaker parrot is that it is gentle and very affectionate which makes it a wonderful pet for a younger member of the family. This is not true of some of the larger parrots like macaws and cockatoos that can be quite aggressive when upset. Colors of the Quaker Parrot. As mentioned they tend to be known as the green and white parrot, but over the years there has been a lot of breeding in captivity so more color combinations are appearing and with different shadings so you could be forgiven for being confused about their colorings. The Quaker parrot is an active parrot and when there are no family members around he will like to keep amused with toys. Something like a climbing gym with bells and mirrors will keep him happy for hours. There are lots of toys on the market, but just make sure they are safe before giving them to the bird. You can see why these parrots would be so popular as a family pet and there is one other feature that also makes them so sought after. They can adapt very well to different climatic conditions which are a bonus as most parrots only like the warmer weather. This is a very big plus for a pet parrot, but unfortunately, it does come with its drawbacks. In some states in the US, it is actually illegal to keep the Quaker parrot as a pet. Due to the fact that it can adapt so well, feral Quaker parrots have caused major problems in the agricultural industry and some states have ruled them illegal. In fact, if this parrot is found in these states, it will be euthanized. So if you are considering having one of these parrots as a pet, do check out the local laws before purchasing. The problem does tend to exist more in the southern states. Interestingly enough the Quaker parrot is also known by other names because of its color. You may have heard him called the ‘Green’ parrot or the ‘Monk’ parrot. 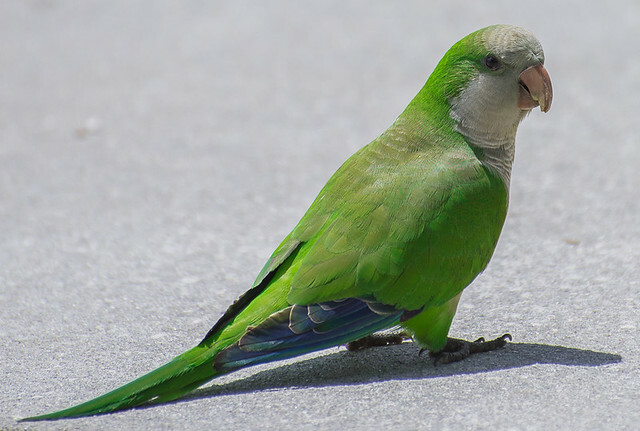 Whether you know them as Quaker parrots or Monk parrots, these little green and gray birds are the subject of a lot of controversy in the U.S. Quakers are illegal to keep in many states. The worry is that escaped individuals will form large wild populations and become a major pest. Whether these laws are based in reality or not, the issue is being hotly debated between parrot welfare groups and governing agencies. You can get more information about this from the internet--I like quakerville.com--but be sure to add the word “parrot” in your search or you will get a bunch of websites about the Quaker religion! This article is about the Quaker as a pet, for those of you who are allowed to have one. Those who can’t are encouraged to become active in the efforts to overturn the restrictive laws so that everyone can enjoy Quakers. Quakers are a small parrot native to South America. They are a very affordable bird compared to other parrots their size. Beautiful color mutations like powder blue and yellow are available, too. They’re more expensive than the normal greens, but as they become more established, the prices become more reasonable. A Quaker’s size makes him easy to accommodate if you don’t have a lot of space, but if you live in an apartment, you may want to check to see how “soundproof” your walls are. Noise is often one of the biggest behavior problems reported by Quaker owners. Nipping is another. These birds are outgoing and active, and their energy levels can be hard for some people to manage. If you’re a patient person and know how to provide a sense of authority without being a bully, you’re more likely to get along with a Quaker than someone who’s either too hesitant or too aggressive. Overall, the Quaker is a feisty but lovable little parrot. One thing that makes them so cute is their lively, bouncy bob. When you see it, you can’t help but be drawn to the bird. Snuggles and kisses are activities Quakers like to engage in, but they’re also playful and like to show off. Their talking ability can be quite impressive, and they tend to be enthusiastic learners. Games and trick training are good ways to provide needed physical and mental exercise, as well as giving your bird some structure to his daily life. Appropriate activity helps the bird channel his energy in a way that’s not as likely to get him into trouble. When behavior problems do occur with Quakers, boredom is a common contributor. Keep your Quaker busy, and you’ll keep him happy. Because Quakers are very social, they’re eager for attention, and will usually want to hang around with you. Encouraging independent play is very important so your Quaker can be by himself when he needs to. You’ll also want him to meet and be handled by other people, and set consistent rules so he knows what he can and can’t get away with. If children are going to handle him, they’ll need to know the rules, too, so they don’t accidentally encourage bad habits. A Quaker may quickly take advantage of a person he thinks isn’t going to make his mind. Some Quakers may be reluctant to step up onto people’s hands. We had one like this. It wasn’t that he didn’t’ want to come to us, but he would rather be picked up like a ball than step up. At first, we thought he had a physical problem or was mentally not too bright, but we eventually realized this wasn’t the case. He just liked being picked up. The people who had him before we did probably took the path of least resistance and never worked on stepping up since it was easier to pick him up. Having talked to other Quaker owners with a similar problem, I think this may be more common in birds that came from large breeding facilities, or any place where the hand feeder didn’t have time to wait for the young bird to figure out the hand thing. Quakers are smart, but they’re also on the stubborn side, which can be part of their charm. That, and their little bob. If you want a bird who can talk, a Quaker parrot is the one you're looking for because parrot Quaker training is easy. It is a fast-learner, develops a bond with the owner and loves to be around people. Results would be better if just one member of the family would teach a parrot how to talk. Even so, you can hear the bird imitating the other members of the family as well. Two things can describe the this parrot: affectionate to its owners and very gentle. This makes it perfect for little family members. Larger parrots on the other hand might not be since they become aggressive when mad. Originally, these Quaker parrots were green and white but since the species evolved during the years, and due to breeding in captivity, there are a variety of color combination and different shades, too. An active parrot likes to play around with toys, especially if he is home alone or when there is no family member available to play with him. A climbing gym, the ones with bells is a good example and will surely keep him amused for a very, very long time. Would you consider keeping a Quaker parrot as a pet? This kind of parrot would be a very good pet not just because it is affectionate and gentle but it adapts well to different environments. This is a very big advantage when keeping a pet bird but we all know that if there is a positive side, there must be a negative side. Some states do not allow keeping the Quaker parrot as a pet. Because it can adapt well, these parrots that have often flown away have caused problems in the agri-industry and that's why they have been considered illegal. Sadly, if these are found anywhere in the states, they will be killed. 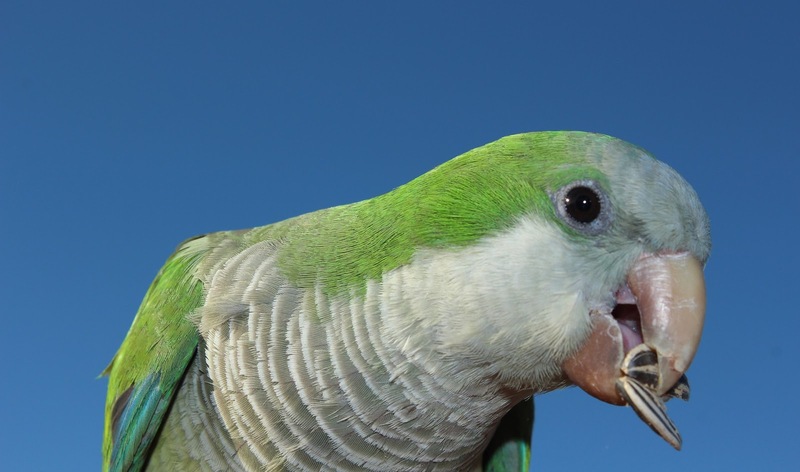 Check laws first before considering buying a Quaker parrot, especially if you live in the southern areas of the United States. If you do decide to keep a pet bird then you will find parrot Quaker training easy because of its intelligence.